Chuda is the set of red and ivory bangles worn by the bride especially in North Indian weddings. 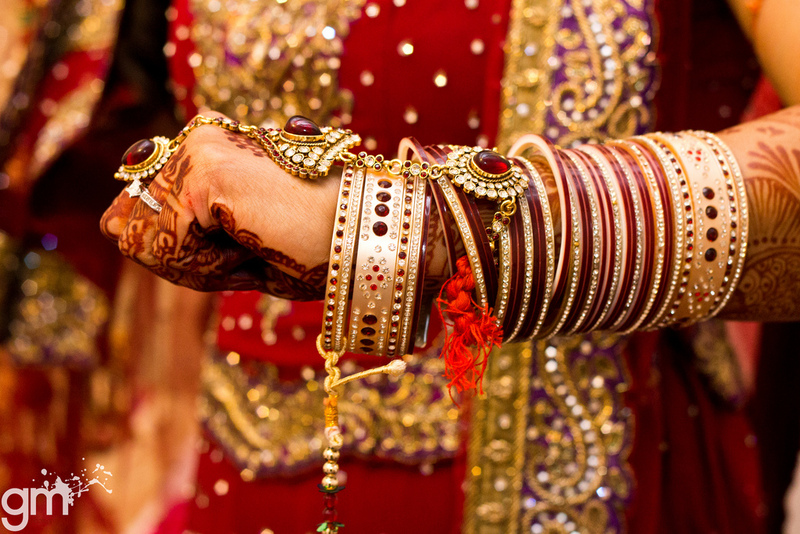 A set of 21 bangles are worn on each hand of the bride. It is a custom to wear the chuda for at least 40 days post wedding, and on the 40th day the groom would remove them for her. Chuda signifies that the girl is newly married. Chuda comes with lot of blessings and is believed to bring good luck in terms of fertility and prosperity into the lives of newly wedded couple. Chuda is different from other bangles, as it just can’t be worn by anyone. Only the newly wedded bride can wear it in the initial days post-wedding. This ceremony takes place in the morning of the wedding day. It can be purchased in fancy shops and can be ordered online too for a particular size. Chudas are soaked in buttermilk overnight. The ritual starts with a havan that is conducted by a pundit. The girl’s parents and her maternal aunt and uncle (oldest available) usually fast throughout the day or till the completion of the chuda ceremony. Post havan, chuda are blessed by all the family members and guests present during this ritual. Once everyone touches and conveys their good luck to the bangles, the girl gets to wear them through her uncle. In addition, she gets gifts like lehenga from him, which she wears during the wedding. During the ceremony, the bride’s friends and cousins sing and dance around her. Fresh flowers are showered on the bride and sweets are distributed amongst all to commemorate the beginning of all the wedding rituals. Traditionally, the chuda would be worn for one year post wedding, though it can be worn for lesser duration depending on the family’s tradition.